This week, we have a behind-the-scenes blog featuring recent bride Yolanda and all her lovely ladies. 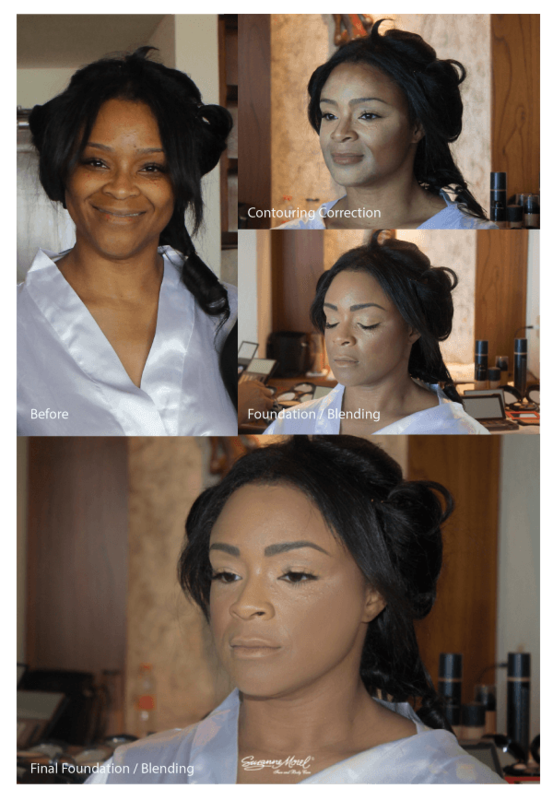 We are excited to share this closer look at how we prep the skin for that perfect bridal look via color correction, blending, contouring and more! As Cabo’s leading bridal hair and make-up salon, we can tell you firsthand that some of the most beautiful, radiant skin tones are found among women of color. And no matter what skin tone you have as a bride, getting that picture-perfect glow you see in professional photographs is always a step-by-step process. Whether or not you have blemishes, freckles or darker spots on your face, there is almost always some color correction required by our team of professionals to get that magazine-worthy radiance. Fortunately, our team is always up-to-date on the most current corrective color techniques! We start by choosing the right shade of correcting concealer or concealing primer for the area we are working on. Yellow, green, pink and even lilac are all useful colors when applying make-up to cover any imperfections. As you can see, these correcting colors are also used to contour and highlight the skin even before we apply the foundation and blend. Once we cover any problem areas and achieve the proper amount of coverage for contouring, then we continue with foundation and begin to blend the base make-up. The blending process is thorough, and results in a skin tone that is radiant and flawless each and every time! As you can see, most of the ladies in Yolanda’s bridal party had different skin pigmentations, as we often encounter with African American, Asian and Hispanic skin. Our professional team knows exactly how to even out these color variations, all while providing a natural, glowing look for your Cabo wedding! The make-up professionals at Suzanne Morel Face and Body Care have the skill and training to help women of every color look and feel their best on their wedding day in Los Cabos! Please call one of our English-speaking concierges to schedule your free consultation today! 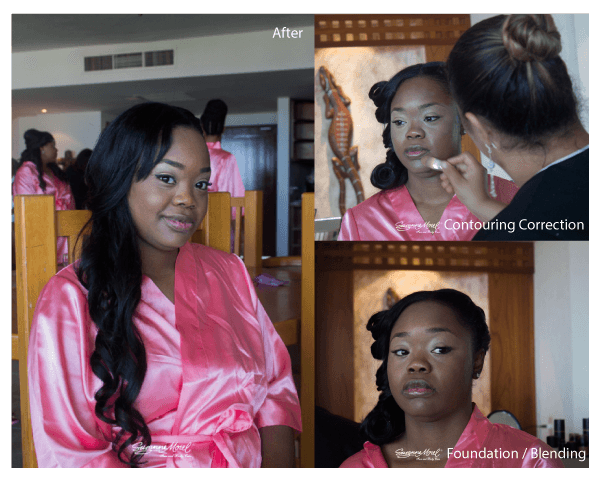 This entry was posted in Cabo Bridal Hair and Makeup and tagged African American wedding makeup, beach wedding makeup, best Cabo bridal salon, bridal makeup trial in Cabo, Cabo bridal makeup, Cabo bridal salon, Cabo wedding makeup, Cabo wedding salon, color correction makeup, contouring wedding makeup, corrective makeup technique, destination wedding makeup, professional makeup artist in Cabo, professional makeup in cabo, Suzanne Morel bridal salon, wedding makeup for women of color.